If you were to walk into a kitchen with all white marble countertops, you’re guaranteed to oooh and ahhh! There’s not doubt about it. White countertops have a strong presence and will definitely make a statement in any room, whether it’s in the kitchen, in the bathroom, outdoors, in the basement, or for commercial use. Nalboor Tiles would like to give other wholesalers some insight about the pros and cons of white marble countertops. They’re not for the faint of heart, but depending on the purpose of the space, you could create a stunning room that could make your first open house visitor place an offer. Here is a list of some pros and cons of white marble countertops. Let’s start with the pros first, because everybody likes good news! This might be an obvious one, but there’s something to be said about the look of all white. With the right kind of décor, white countertops can be the focal point of a space. Because of the lustrous shine of marble alone, the white color provides a timeless look that is synonymous with a classic period reminiscent to old world charm and class mixed with modern-day posh. White marble countertops are pretty! In most, if not all cases, pretty sells! They brighten up a space. Here is where you can get a little smart about your space. The light and bright surface of white marble gives off a slight reflection, and this can give the appearance of more space. For a builder, this is considered to be a strategic piece of material to have. The white countertops will brighten up a room making a small space feel a bit more airy and spacious, whereas a darker countertop may cast a heavier shadow and won’t reflect as much light because the darker color would simply absorb the light. White countertops provides a clean and sterile look—something that is most appreciated in restaurant kitchens. It’s also great for hospitals, veterinary clinics—any facility where cleanliness is an absolute must. A clean white countertop ensures that the space is sterile. White countertops are a task to keep clean, and hardly anyone would have the time to keep a white countertop looking spotless all of the time—unless they hired someone to do it! Hired help is usually synonymous with wealth. Keeping a spotless white countertop simply gives the impression of a luxurious lifestyle. Surprisingly enough, white countertops don’t cost that much. They are typically far less expensive than the more popular countertops that are in high demand. Of course, this all depends on what kind of marble tile you get. Nalboor Tiles, a natural stone tile distributor based in Miami, Florida, stocks a wide variety of marble tile in style. Vanilla Oro – Priced at $6.45 a square foot, this is going to be your least expensive option. The beige veining in this pattern is barely noticeable. It’s thin enough to tone down the bright white color offering a softer presentation. Bianco White Carrara – For only a nickel more, you’ll have a darker veining that truly gives the appearance of classic marble. The surface actually looks more gray than white, but the overall look weighs more in the lighter side. Statuario Ventatino Marble – Mined from Italy, you will pay more for this precious stone at $8.95 a square foot. This type of marble has a stronger veining than Bianco White Carrara. Here, the gray veining is a hair thicker. Volakas White Marble – This beautiful piece of stone is priced at $10.95 a square foot, but don’t let that intimidate you. Nalboor Tiles offers a generous discount for bulk buyers. The Volakas White Marble is reminiscent to a glacier slope with its watery beige hues creating a soft movement that would complement any type of décor. And now for the CONS! All marble requires an annual sealant because while they are waterproof and even fireproof, they’re also a bit porous. Without the proper sealant, any acidic spill could seep into the pores of the marble surface discoloring the surface and eat away at the luster. Might be too sterile for some tastes. While a white countertop may bring about a cleanly elegance for some people, it may equally be off putting for others. Too sterile of an environment may not be the tone that some buyers are looking for. Therefore, it’s not usually the first choice that most builders would incorporate into a new dwelling, unless they were contracted to do it. White countertops for kitchen use may not always be favorable for residential use, especially in a family home when that particular space is in use at least three times out of the day. Some families may not find having a white countertop favorable because it shows every kind of stain. Even with children and an annual sealant, the chances of cleaning of a spill in time before it seeps through the pores isn’t always guaranteed. 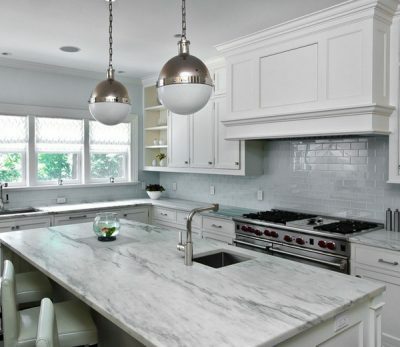 Depending on what you’re building your dwelling for, a white marble countertop might be ideal. If you find yourself building more commercial dwellings, then it may be a good idea to stock white marble for your countertops. The choice is yours. Speak to a Nalboor Tiles representative to learn about other white tile options we have for your building needs. Contact us today at 305-501-4548 or reach us online.